That is the mantra these days. I feel that pang of guilt if I toss or discard items into the trash. It is important to take what we already have and find alternate uses, isn’t it! I especially hate those plastic bags at the grocery store. I hope that soon we will see those banned but in the meantime we must all find alternate ways to tote our groceries around. I’ve been collecting some pretty old pillowcases here and there with the intention of turning them into quick and easy tote bags for groceries, etc. 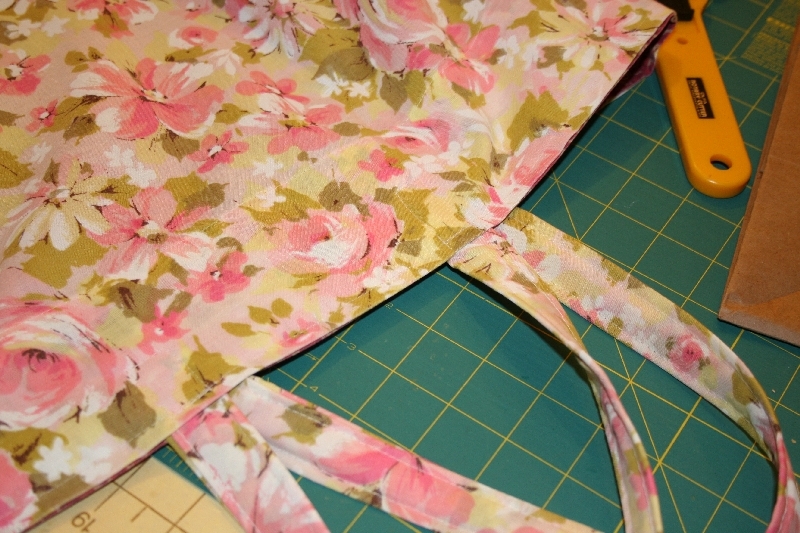 I finally sat down the other night and put one together and I’m pleased with the results, a nice sturdy bag that will tote your groceries and it can be tossed into the washer when necessary. I combined two pillowcases to make this bag sturdy. I used a paper grocery bag as a guide for my measurements. First I stacked the pillowcases and cut off the bottoms to an even length. I cut them about six inches longer than the grocery bag. Next I just stitched across the bottom of each case. Then I took the case that was for the lining and turned it wrong side out and inserted it inside the other case. Then holding the cases together with the hemmed edges together at the top I turned them inside out. The lining case was now on the outside and the floral case is on the inside and they have wrong sides together. Now holding them together I folded the corners so they made a point and stitched across each one about 4 inches from the tip. 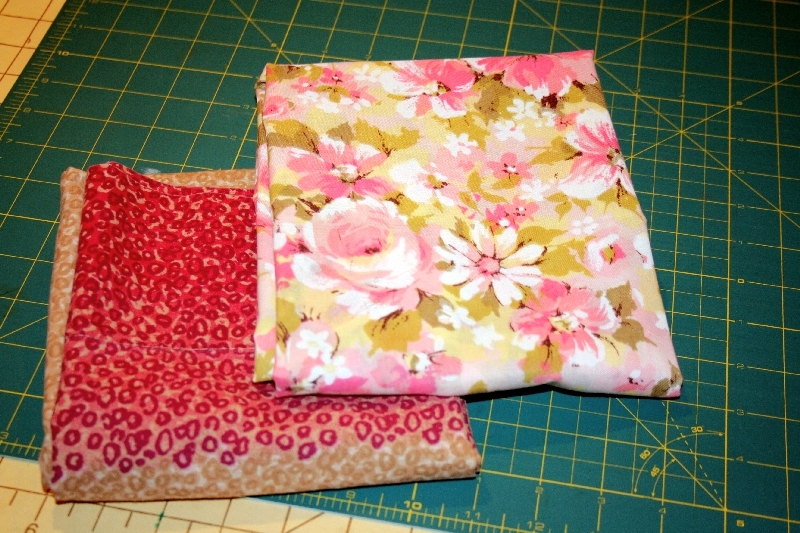 I am stitching through both cases here, the floral one is inside. 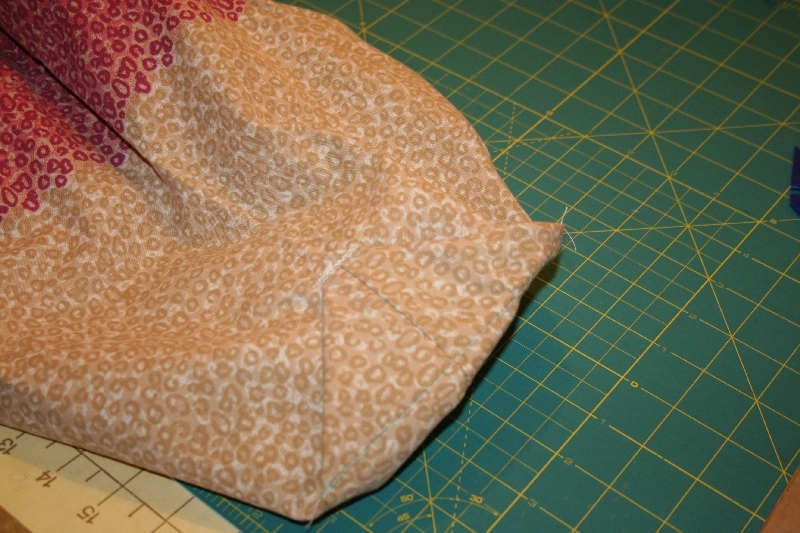 Next I folded these points along the stitching line up towards the sides and tacked them in place. This creates a box bottom for the bag. 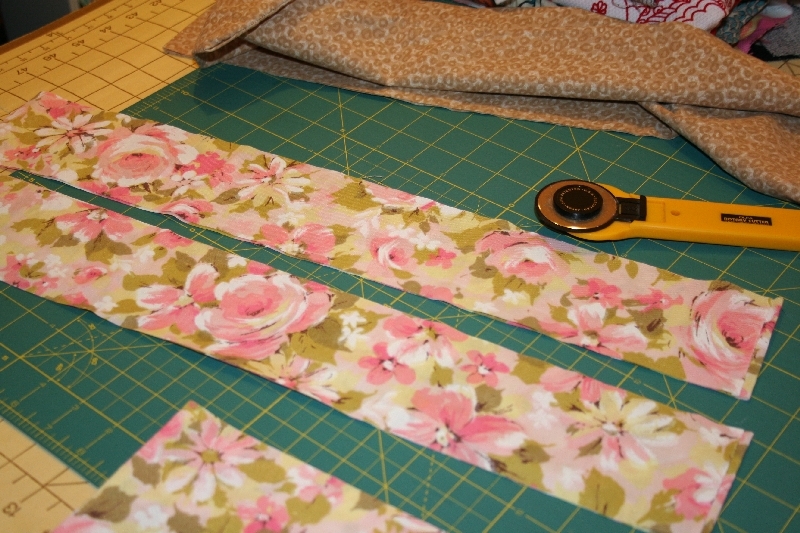 With the left over fabric from the floral case I cut two strips 3 inches wide. Here you see the strips just as I cut them from the leftover case, therefore each strip is double. 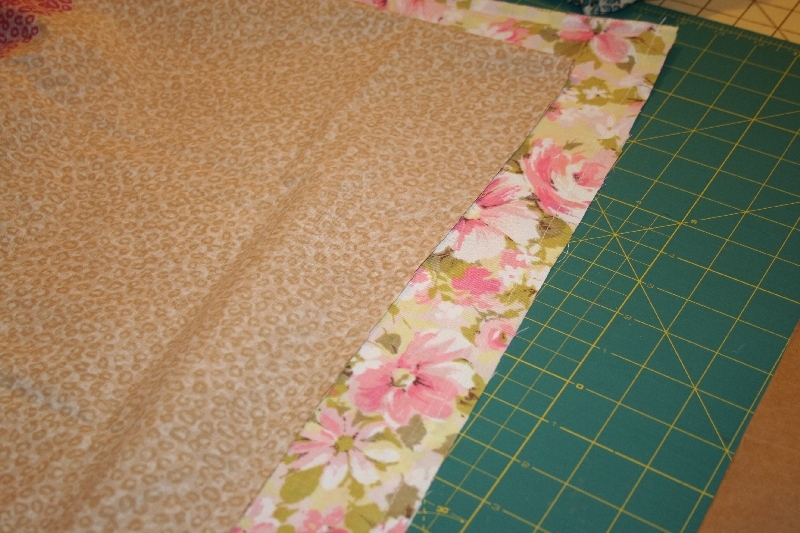 I just folded each double strip in half lengthwise and sewed a 1/2 inch seam along the long edge. Using my fasturn I turned the strips right side out to form two tubes. (each tube is 2 layers of fabric) I ironed the tubes flat and topstitched along each long edge. Next I inserted the tubes between the two cases along the top edges, spacing them about 5 inches apart and centered. I pinned these in place and sewed both pillowcases together along the top, already hemmed, edge. I stitched again over the handles to reinforce. Voila! I think this project took about 20 minutes. Doubling up the pillowcases makes these very sturdy. 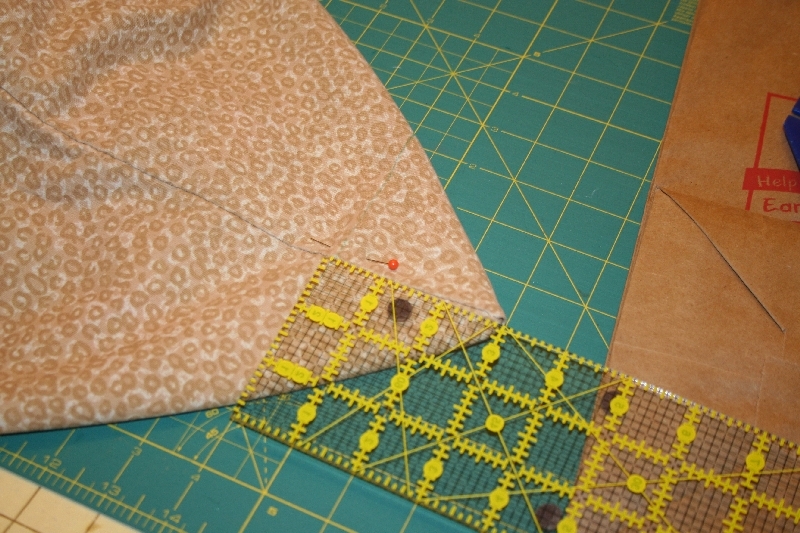 The pillowcase challenge over at Handmade Parade is what got me thinking about this project. 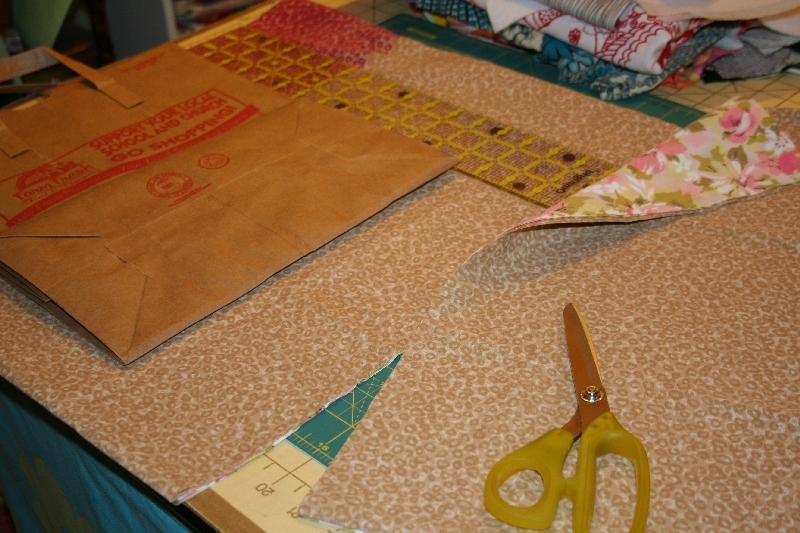 I had another idea for recycling those pretty vintage pillowcases and this one I have entered in the contest. I think the simplicity of this is it’s strongest feature and it used up almost the entire pillowcase. This is a dust cover for the sewing machine. My machine sits out all the time and collects a ton of dust even though I use it almost every day. Actually I think I am creating most of that dust when I sew! 20 minutes! It would take me 20 hours or more! I wish I knew how to sew. This is a great idea – you should offer some in your shop. I agree on the plastic bags. Trader Joe’s has funky reusable bags that I leave in my car at all times for trips to the grocery store, pharmacy, Target, etc. The bagger at the grocery store always looks at me like I’m crazy but I’m seeing more and more people using reusable bags. I love the tote and the cover for your machine. Awesome! The sewing machine cozy is so clever and I agree, I hate those plastic shopping bags–why are they not accepted in the curbside recycle bins? wow! I love the bag! I just purchased my first mesh bag the other night and now I want to make some! I love these! First I need the fast turn! Love he sewing machine cover too but I think the bag gets first prize! What a clever idea! great tutorial! you go girl! Your bag is a great idea and so pretty- and you’re right, it would be so much better to carry a couple of reusable totes in the car than use a plastic bag for every purchase. When my girls were tiny babies, I used to make them little summer dresses from embroiderd pillowcases – they used to turn out so cute and original. 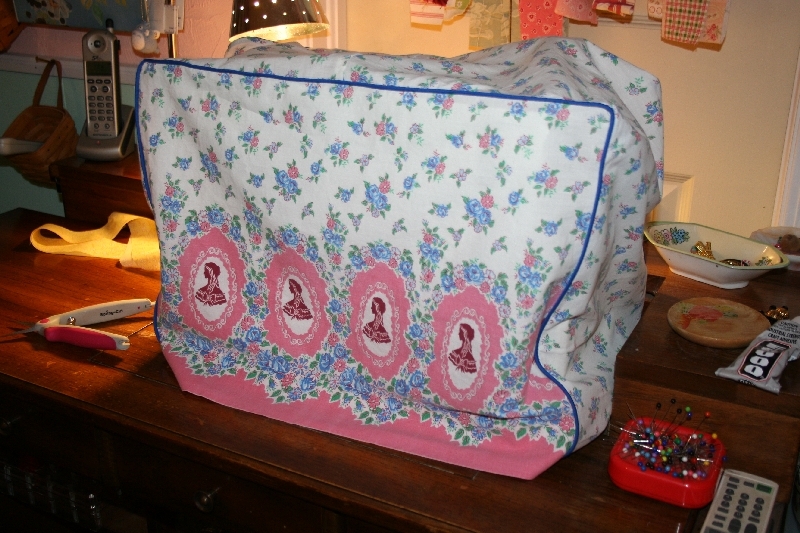 I absolutely love both the totes and the sewing machine cover!! Fabulous! How cute!! I love the idea. I too am trying not to use plastic bags. Love the dust cover too. Love the tutorial for the boxed bottom effect. I’ll try that. Wonderful bag too and I love the (pillow case) fabric. Those are great ideas for re-purposing pillow cases. I’m big on recycling & re-using things…today I made my first pin cushion using some of the cotton batting from my old chair (I am currently re-upholstering it). I have a lot of the cotton so it will get used for stuffing other things I have in mind. I’ve been trying to make something with the pillowcase challenge, but I may not make it in time for the contest deadline. OH yes you gotta love fabric dust, lol it make so much fluff doesn’t it! Loving the bag and the whole idea of using pillowcases! You are just way too clever! Love the tote bag! I’ve had that same vintage floral pillowcase before, too, and I’ve used it all up making bags, flowers, yo-yo’s, whatever. Beautiful! Actually, neither paper nor plastic bags disintegrate in a landfill — nothing does. (Landfills are designed to keep O2 and water out — and both are necessary for anything to decompose.) Both paper and plastic are recyclable. And if you’ve ever been near a paper plant, you’d know that they are far less environmentally friendly (usually waste is dumped into the nearby lake/river — after treatment, but it still smells, etc) than a plastics facility, where there is nearly zero waste (and nothing going into the water). PS — Also consider that the cost to transport plastic bags is, more than likely, significantly lower (per bag) than the cost to transport paper bags (because of weight). Just more reason for us to use the reusable kind of tote for our groceries, etc.! My town recycles paper bags but they do not recycle plastic bags. Lots of materials are “recycleable” but yet the province where you live does not recycle that product. Everyone just needs to be more consumer conscious of what we dispose of. period. Your completed bag is very pretty! 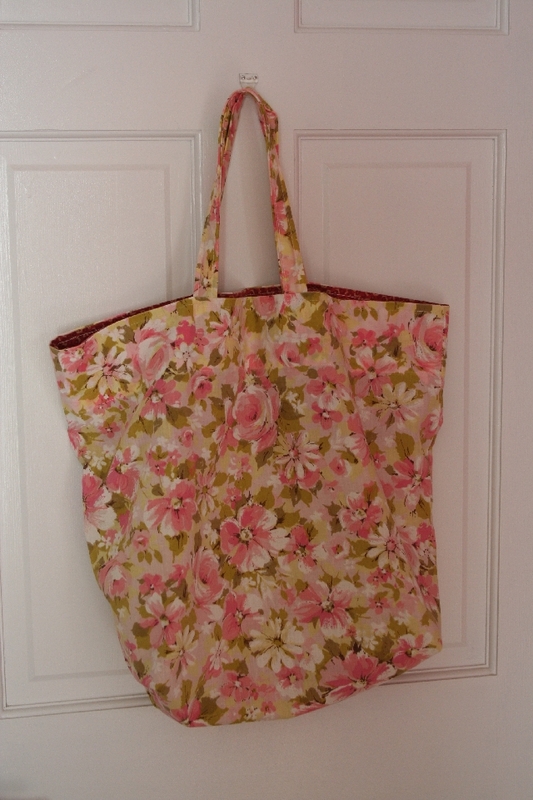 Almost too pretty to just use as a grocery bag! I applaud your inventiveness and am determined to revive my sewing machine and dig out some lovely old redundant pillow cases I have stored away.. I wholeheartedly agree with you about the plastic bag dilemma. I recycle all my plastic bags but so many are thrown in landfill sites. This is a very healthy alternative… pillowcase solution! Speaking of those plastic bags and recycling, I found an article in [some] magazine that shows you how you can weave them together to make a bag!! If I can find it, I’ll scan it and send it to you.